I. What To Know About Diarrhea? II. How To Get Rid Of Diarrhea? III. When To See Doctor? IV. How To Prevent Diarrhea? Diarrhea is a common disease that you may experience at least once in your life. There are many causes of diarrhea, some people have severe diarrhea, some experience milder diarrhea, but most symptoms are not pleasant at all. In normal cases, you do not need to go to a hospital but can cure yourself at home by natural methods. In today's article, Effective Remedies will help you understand diarrhea as well as some useful ways on how to get rid of diarrhea in infants and adults fast at home. Diarrhea is a condition that you defecate many times (over three times a day), often accompanied by abnormal symptoms, such as watery stools and stomach pain. Diarrhea makes the body tired and exhausted in several days. If you don’t treat diarrhea timely, it will lead to dehydration, heart failure, and the risk of death. You have a bowel movementfrequently, at least three times a day. Abnormal stool: loose stool, strange color stool, or bloody stool. The symptoms depend on the severity and development of the disease. You must watch your symptoms to choose the suitable remedy. 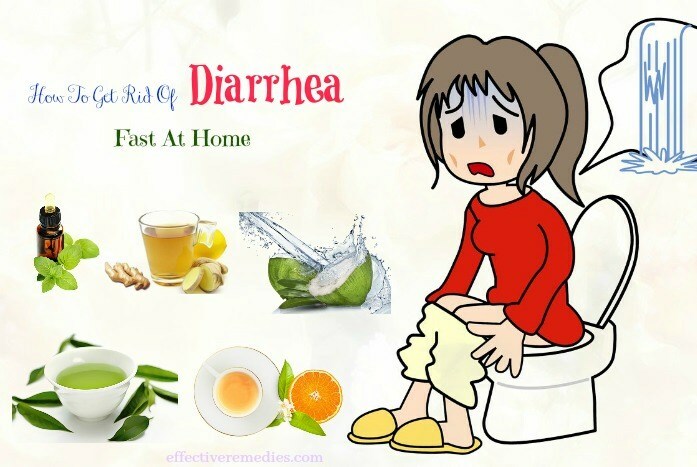 The fastest way to find the effective ways on how to get rid of diarrhea naturally at home is to know the main cause of diarrhea. Read some common causes below and think about what causes your diarrhea. It is one of the most common causes of diarrhea. An infection occurs when you used contaminated water or ate rancid food.Contaminated water contains many parasites, bacteria, and eating rancid food which contains harmful microbe can lead to food poisoning. Some people are allergic to foods such as seafood, nuts, spices, etc.Diarrhea is just one of the symptoms of food allergies. If you have diarrhea with other signs such as itching, rash, difficulty breathing, dizziness, etc., you may have food allergies. One of the most common food allergies is lactose intolerance. People who have trouble digesting lactose should not drink milk or eat dairy products to prevent diarrhea.Sometimes diarrhea can be caused by fructose. Almost beverages use fructose as a sweetener. Be careful in choosing food and beverages if your stomach is difficult to digest fructose. Crohn's disease, ulcerative colitis, celiac disease, microscopic colitis and irritable bowel syndrome are some other causes of diarrhea. If you are in these conditions, do to see a doctor as soon as possible. No one wants to have diarrhea, but if it happens, you have to keep calm and do not worry too much. Try some home remedies below, they will help you feel better. Diarrhea causes your body to lose water very quickly. The body is dehydrated through stool and vomiting. So you need to drink water as much as possible, do not wait until you feel thirsty. Taking small sips of water is better than drinking too much at the same time. Drinking enough water also helps to reduce fatigue. Add the chamomile flowers and peppermint to a cup of boiling water and steep them for several minutes. Drink while it’s warm twice a day. It is rich in electrolytes and minerals that help hydrate the body quickly. Drink a glass of fresh coconut water twice a day can help you get rid of diarrhea fast. Prepare: 2 tbsp of the chopped orange peels, ½ cup of boiling water, lemon juice, and honey. Put the chopped orange peels into the cup of boiling water and let it cool. Add a little lemon juice and honey to it and drink this solution 2-3 times a day. Prepare: 1tsp of ginger powder, 1tsp of cumin powder, 1tsp of cinnamon powder, 1tsp of honey, a glass of water. Mix all the ingredients in a glass of water and stir this mixture. Drink it 2-3times a day. Apple cider vinegar is capable of killing harmful bacteria and balancing the pH of the stomach. Put 1tsp of apple cider vinegar in a glass of water, stir and drink it. You should use 1-2 times a day. Green tea has many great benefits for your health. The antioxidants in green tea help maintain the function of the body. Green tea is also antimicrobial agent, helping to eliminate toxins.Fresh green tea leaves are the best, but you can use the tea bag as well. You need 2 cups of tea a day. According to studies, taking peppermint oil capsules aid in relieving the signs of irritable bowel syndrome .However, you should remember to take peppermint oil in capsule form. This form allows the peppermint oil to pass your stomach and be removed in your small intestine. Yogurt helps you reduce diarrhea because yogurt is a probiotic which contains live cultures of healthy bacteria, such as Lactobacillus acidophilus and Bifidobacterium. These bacteria will remove harmful bacteria and restore balance in the intestines, especially in case of diarrhea caused by antibiotics . Make sure that your yogurt is 100% fresh (free from artificial sweeteners and flavorings). Bananas have many health benefits, and you can use bananas as a home remedy to get rid of diarrhea fast. Because bananas are rich in pectin – a soluble fiber which is good for the digestion, it makes your stools less watery.Bananas also contain potassium – the electrolytes that your body loses due to the frequent bowel movements. You should eat two bananas with your breakfast. Oatmeal is rich in soluble fiber that prevents water loss from the body. It can replace rice very well during diarrhea. Mix the oatmeal with buttermilk or boiling water and eat 2-3 times a day. Remember: don’t eat too much at one time because it makes your stomach difficult to digest. Split into several meals, try to eat small amounts throughout the day. Carrot soup has an anti-diarrheic effect on diarrhea in infants and toddlers. In the study, eating carrot soup can help to get rid of diarrhea quickly and safely . You can make carrot soup by washing, scraping, and chopping 500g carrots. Then,add the carrots to 150 ml of water and pressure cook them for 15 minutes. After that, strain the entire pulp and dilute it with hot water. You can add a little salt to it. Eat this soup daily for several days when experiencing diarrhea. When you are sick, you have to rest. You must do the same when you have diarrhea. Rest is the main key to get rid of diarrhea fast. Try to sleep whenever the symptoms do not bother you. Avoid strong physical movements. Do not let yourself be stressed out. You can use BRAT diet as an effective home remedy for getting rid of diarrhea. BRAT diet refers to Bananas, Rice, Applesauce, Tea, and Toast. That foods contain very little acidity and simple sugars. They will relieve the symptoms of diarrhea very quickly. You should use only raw cultured dairy like live yogurt which is high in probiotics. 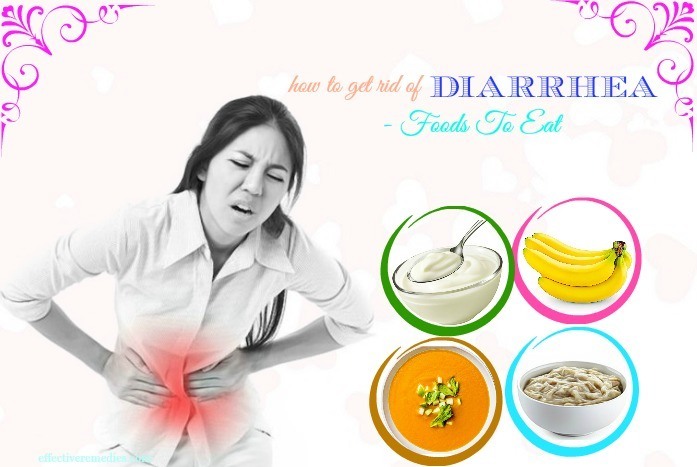 Don’t use processed dairy products because it can make diarrhea worse. 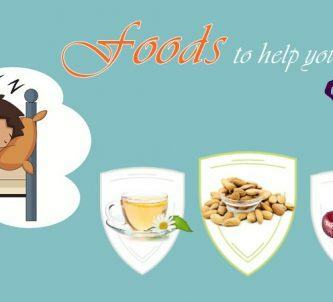 If you are allergic to certain foods such as gluten, nuts, shellfish, seafood, dairy,…it’s better to avoid all of them. Don’t eat packaged products like fast foods, cheesy foods, processed meats or fried foods because they contain too many fats and oils which can upset your sensitive stomach during diarrhea. Avoid sugar and artificial sweeteners because sugar makes harmful bacteria stronger. 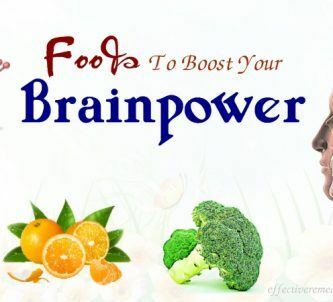 They may destroy the immune system and reduce digestive functioning. Get rid of caffeine and alcohol completely during diarrhea. In some cases, using certain supplements can aid in improving our gut and digestive health, help process the foods you’re eating easily, and soothe your upset stomach. Digestive Enzymes: You can take 2 before each meal to help absorb nutrients easily. Glutamine powder: You should use 5 grams for 2 times daily to help repair your digestive tract. Aloe vera juice: Try 1/2 cup for 3 times daily to heal the lining of your digestive system. Your body is severe dehydration. You may see some signs: always feel thirsty, little or no urination, dizziness, dry mouth or skin, etc. Diarrhea can be prevented, except for diarrhea which caused by unavoidable causes like medications. An important rule to remember is to keep your hand clean and hygienic to prevent bacteria from spreading. Remember to wash your hand after doing tasks that contact directly with the bacteria. Wash your hand carefully with soap after using the toilet or cleaning the toilet. Do hand washing before and after preparing foods, especially after handling uncooked meat. You must wash your hand after sneezing and coughing. Changing eating habits also helps prevent diarrhea. Do not eat contaminated food that hasn’t been processed and cooked, raw foods such as fish salad, etc. Find the safe sources and proven origin to buy foods. Don’t use expired foods. Cooked or leftover foods should be kept well from the last meal to the next. If you have an infant, you should have your child vaccinated to prevent rotavirus. Sometimes viruses and bacteria that cause diarrhea affect people who travel to countries where have poor sanitation. If you are in that case, be careful to choose what you eat and drink. Always eat foods that were well-cooked. Avoid raw fruits and vegetables (if you like to eat them, please wash them with salt and peel them). Don’t eat foods from street vendors. Don’t drink tap water and don’t use ice cubes. It’d better use bottled water, even when you brush your teeth. If you are a careful person, you can boil bottled water, let it cool and use. 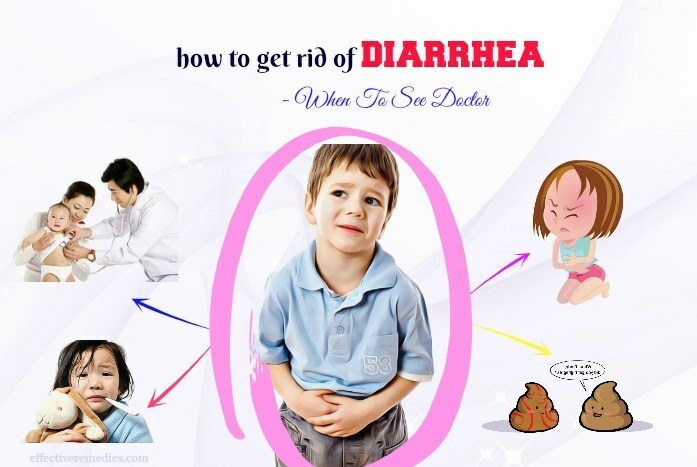 Above is all the knowledge you need to know about diarrhea and some effective tips on how to get rid of diarrhea in infants and adults fast at home. Save it in case of need. In the page How To, we have many natural treatments for other health condition. Visit us to learn more.